Conjure up a Bed and Breakfast, and chances are the image of a large old Victorian home comes to mind. The 30-year-old handsome grey-brick house that is the Dove Nest Bed and Breakfast is far from the stereotype, certainly as far as the exterior is concerned. But once indoors, old-fashioned comforts reassure guests that they are in for a classic B&B experience. The proprietors of the Dove Nest, John Nelson and his Czech-born wife Jitka, opened their Bed and Breakfast just one year ago. But they have taken to the role of innkeepers like naturals. Over a welcome treat of freshly brewed coffee, a gourmet selection of teas and delicious homemade cake, they gave us an overview of the local attractions: no fewer than eight wineries within a 15-minute drive; quaint downtown St. Joseph, which hosts “Antiques on the Bluff” once a month; and Lake Michigan’s nostalgia-rich Silver Beach, consistently rated one of the best in the country (Dove Nest will supply a free parking pass). While sitting in front of the wonderfully efficient natural stone fireplace, we were able to peruse menus of several recommended nearby restaurants; Dove Nest’s excellent relationship with the Zagat-rated Grande Mere Inn resulted in VIP service — and a sweet surprise: complimentary desserts. A warming fire greeted us back at Dove Nest — whose name, by the way, is no mere flight of fancy: the property is home to prize doves whose cooing serenades guests. Each of the B&B’s four guest rooms is also aptly named: for example, Pond View overlooks the small body of water stocked with ornamental koi, while Garden Victoria surveys the beautifully manicured grounds professionally landscaped by the owners’ commercial nursery. The lawns and colorful flowers are not just meant to be admired from afar. Chairs, benches, even a swinging loveseat and hammocks are interspersed among the natural surroundings — nooks designed to be ideal for reading, conversing or simply contemplating in tranquility. The same attention to taste and detail extends to the rooms’ furnishings as well. The comfortable beds feature plush mattresses, exquisite linens and thick duvets. Entertainment options abound: large-screen plasma TV’s, DVD players, full stereo units and complimentary WiFi access; borrow books, DVD’s or CD’s from the inn’s library. 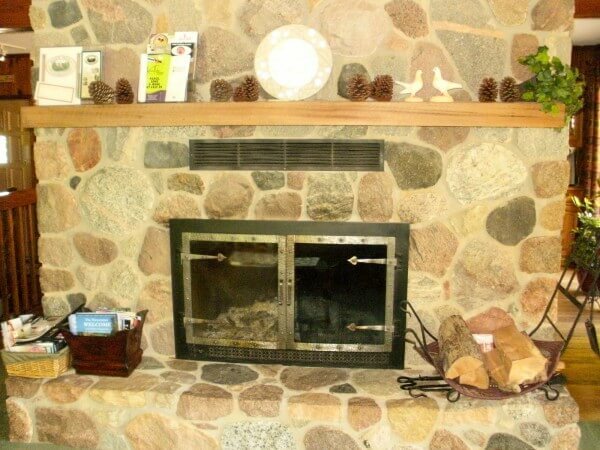 Climate control is facilitated by central air conditioning and simulated fireplace units. Pampering personal touches include soft velour robes and bedside chocolates. The en-suite bathrooms contain full-sized bathtubs and hair dryers. The corner Royal Oak room is the inn’s most luxuriously appointed, with upgrades including a make-up mirror, spacious walk-in closet with compact refrigerator (complete with cold beverages), and a large whirlpool tub surrounded by soft-glowing electric candles and a salver of bath salts. The other specialty room is Blue Sky, which can expand to a two-room suite. The elegance of the rooms carries over into breakfast, whose three courses compete for best presentation. A stemmed goblet brimming with fresh fruit, yogurt and granola is paired with a buttery croissant, followed by omelet en croute and, finally, waffles with seasonal berries and whipped cream. A choice of fruit juices and excellent coffee accompany the tasty meal. Guests may elect to eat in the dining room or at individual tables indoors or al fresco. 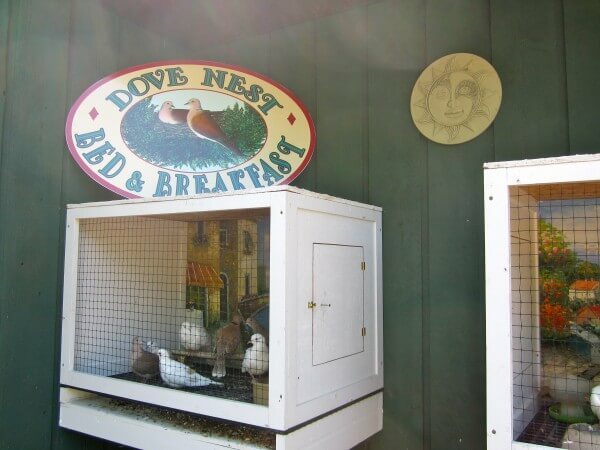 The Dove Nest is open year-round, including on Christmas. Whether you get away for an ordinary weekend or a major holiday, you are sure to enjoy hospitality at the highest level. Text and photos by Buzzy Gordon, who was hosted by Dove Nest B&B for purposes of review. Over the course of a 40-year career that has spanned more than 80 countries, award-winning journalist Buzzy Gordon has been a reporter, editor, and travel writer on five continents. His work has appeared in USA Today (where he was a regular travel columnist), National Geographic Traveler, The Los Angeles Times and The Washington Post, among other leading publications. Buzzy is the author of Frommer’s Jerusalem Day by Day Guide and a contributor to publications in Isael and the United States.